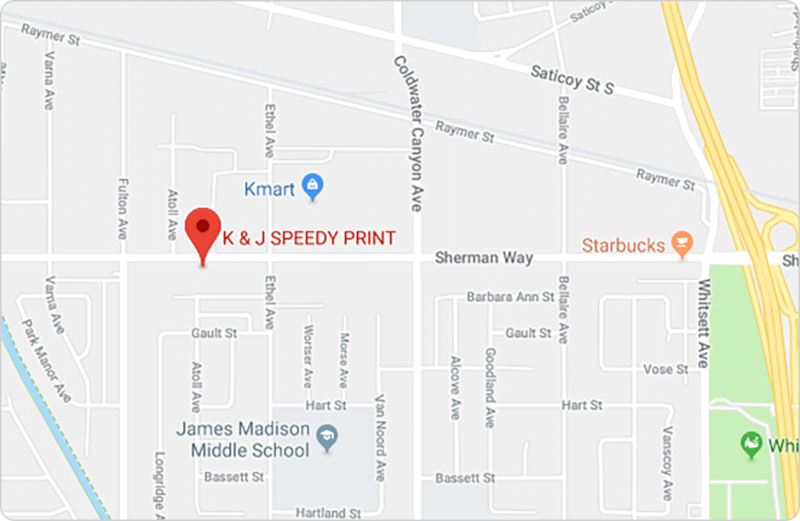 K&J Speedy Printing has provided outstanding commercial printing services at an affordable price to Los Angeles businesses for 40 years. We work fast and efficiently to deliver state of the art printing solutions with a personalized touch to North Hollywood, the San Fernando Valley and Los Angeles County. Our full-color offset and digital printing services are ideal for business, advertising, marketing, retail, special events, trade shows and more. From corporate presentation packages to catalogs to embossed invitations to business cards, K&J Speedy Printing will work closely with you to determine the best paper stock, ink, finishes, binding and printing technology to suit your needs. Request a free printing quote here or call us at 1-818-765-7444. Our professional printing team combines the highest standard of excellence with individualized service. We treat each and every print job with diligence, care and respect. Ask us about our die cutting, lamination, binding and other finishing services. K&J printed specialty business cards for me with a matte silk laminate and spot UV gloss. They turned out really nice, the price was fair and they were “speedy!” They told me the cards could take 5 to 7 days but the cards were done after two days. I’m very happy with my cards! I was looking for magnets to my business van , stop by K&J 1st time, got inside the store told the guy what I want to do,the guy was nice and professional the way he measured the size also the way he designed the magnet, amazing job, nice people and good service thank you John!!!! The need a TEN STARS rating specifically for K&J….I have done business with them for 6 years….with a wide variety of projects… you name it. Each and every time that have gone OUT of their way to provide exceptional customer service and support, as well as top quality work AND competitive pricing. Simply, the BEST.